The aim of this book chapter is to indicate how quantum phenomena are affecting the operation of microscopic thermal machines, such as engines and refrigerators. As converting heat to work is one of the fundamental concerns in thermodynamics, the platform of quantum thermal machines sheds light on thermodynamics in the quantum regime. This chapter focuses on the basic features of quantum mechanics, such as energy quantization, the uncertainty principle, quantum coherence and correlations, and their manifestation in microscopic thermal devices. 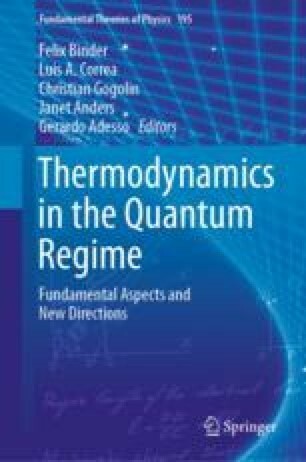 In addition to indicating the peculiar behaviors of thermal-machines due to their non-classical aspects, we present quantum-thermodynamic signatures of these machines. Any violation of the classical thermodynamic bounds observed in the outcome of measurements on theses machines is a sufficient condition to conclude that quantum effects are present in the operation of that thermal machine. Experimental setups demonstrating some of these results are also presented. We thank R. Kosloff, R. Uzdin, D. Jennings, M. Lostaglio, D. Jasrasaria, A. Bylinskii, D. Gangloff, R. Islam, A. Aspuru-Guzik and V. Vuletic for useful comments and for sharing their wisdom. We also acknowledge J. Klatzow, J. N. Becker and E. Poem. for sharing their experimental results and preparing Fig. 4.7.